Going green isn’t just good for the planet, it’s good for our patients. Dr. Satwah is dedicated to keeping you healthy through environmentally sustainable practices. In big and small ways, we’ve invested in the technology to make your trip to the dentist good for you and the planet. 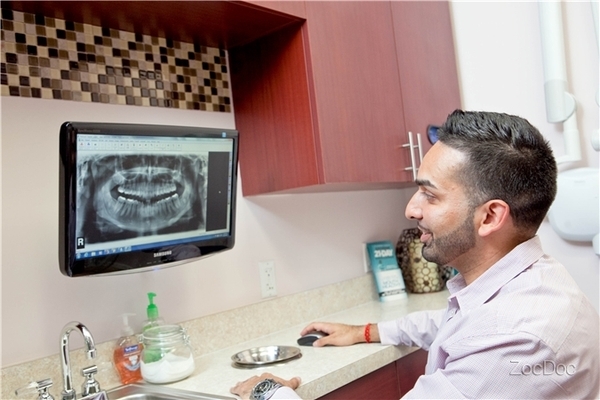 Our digital tooth imaging technology exposes you to 90% less radiation than traditional x-rays. It also eliminates the need for toxic development chemicals and film. Our dry vacuum suction system is a newer dental technology that uses no water - a huge savings compared to a traditional vacuum system that consumes approximately a gallon every minute of the typical 8 hour work day. And our special water filtration system allows for environmentally sound disposal of old mercury fillings to prevent pollution to our local water ways. The materials that we use in all our dental procedures are non-toxic, maintaining your health and wellbeing for years to come. We also make every effort to decrease our carbon footprint from maximizing energy efficiency to reducing paper. Contact our Kendall Park dental office if you have questions regarding the safe and natural dental techniques and technology we offer.